Kitchens Are Monkey Business: February 2, 2017. Dinner At The Saltbox Café. Taking It Down To New Orleans. February 2, 2017. Dinner At The Saltbox Café. Taking It Down To New Orleans. IT'S NEW ORLEANS AT THE SALTBOX CAFÉ! Welcome to The Saltbox Café and their on-going wine/dinner series. It's "Taking It Down To New Orleans." I've been so looking forward to a New Orleans dinner, especially since Chef Randolph cheffed for about 8 years in NOLA some 25 years ago. In fact, I'd been making guesses as to what would be on the menu. I must say, I should've placed bets! I was hoping for Oysters Rockefeller and was not disappointed. I got shrimp and remoulade correct, along with red beans and rice, a gumbo, some type of crawfish preparation, and praline. I predicted and missed on the jambalaya and alligator, although Chef Randolph admitted that 'gater had been an option. The elusive April, behind the bar. Tonight's dinner is the creation of Chefs Amanda and Randolph Sprinkle. Your servers are the outstanding Dinklewolf team - Mike and April. Kerry and Joey of Tryon Distributing presented the wines. Chef Randolph's Notes: Welcome to our New Orleans Wine Dinner. I wanted to do new New Orleans because when I got to New Orleans it was during a very different time. I got there right when the Old Guard restaurants - Antoine's, Arnaud's, Commander's Palace, Tujague's - were taking a backseat to this new revival of food that came around with Emeril, Susan Spicer, and Michael Fennelly. After doing the "old" stuff probably for 3 years, I was so young and eager to jump into this new, really exciting, different style of food. I wanted to do New School tonight, but then my wife wanted to go back to "Old School" New Orleans tonight and I was like, "OK, we can do that! So, it's Old School tonight." Rosie Note: A chorus of "Smart man" reverberated throughout the dining area. Traditional Shrimp Boil with Remoulade and Tomato paired with Meyer Fonne, Alsace Edelzwicker 2015. Kerry's Comments: On behalf of myself and Joey, of Tryon Distributing, we're always honored to be here for these wine dinners, especially tonight because I'm really excited about this cuisine and also the concept of pairing French wines with Louisiana fare. Of course, with all the great Cajun and Creole cuisines clashing - the rural Cajun and the European-influenced Creole, our dinner is going to be outstanding. I want you to try a little bit of each wine, prior to and along with each course. It's fun to see how the characteristics can change, or meld and marry with the chef's creations. To start things off, we have a beautifully aromatic white wine. This comes from the Alsace region. This is right along the Rhine, the German border, running north to south, an area that Germany actually annexed several times in history. There's a lot of German influence in this area. Although it's really its own area as a wine region, it's different from Germany. There are a lot of varietals. It's nestled just to the east of the Vosges Mountains. It's really one of the features that makes it so unique. All these storms that come across Europe usually dissipate in the Vosges range, so they get a lot of average sunny days. There's a lot of ripening that goes on the vineyards there. This is Meyer Fonné. That's the producer. This is a family that's been producing in Katzenthal which is just up from Colmar, a big city right on the Rhine close to Switzerland. Feliz Meyer really is a rising star, taking this winery over in the early 90s and doing some dynamic things with it, "modernizing equipment in the winery, developing export sales, and now expanding the family's holdings in many of Alsaces' great vineyard sites, ... with an emphasis on tradition and respect for terroir." "Edelzwicker" is an Alsatian wine term from the German edel, meaning noble, and zwicker, meaning blend. The noble varieties (Riesling, Pinot Gris, Muscat, Gewarztraminer) were blended with other wines (Pinot Blanc, Sylvaner, Chasselas) and they ended up with a beautifully aromatic white. It has honeysuckle and delightfully pretty characteristics. Chef Randolph's Notes: We fell in love with this wine. Really nice aromatic scent. Our first course is a very light shrimp remoulade. Now one of the things you'll notice is that in New Orleans, they don't steam shrimp. They boil it. The boil is very highly seasoned and one of the seasonings you'll see, only pretty much in New Orleans, is clove. There's a lot of clove in the boil. So, it's a little bit spicy. The remoulade is a mayonnaise-based sauce with roasted red peppers, celery, horseradish, and whole grain mustard. Enjoy! Rosie's Wine Nots: You can zwicker my edel anytime. Chef Amanda and Nohea, plating. This makes me want to boil shrimp right now and serve it with a remoulade sauce. Second Course: Oysters Rockefeller a la Antoine paired with E Guigal, Cotes du Rhone Blanc 2014. Kerry's Comments: For our second white wine of the evening, we go to the Rhone Valley of France. This wine is by Etienne Guigal. A master blender, he started the winery in the early 1900s. The Rhone is the one of the oldest growing regions in France. In fact, ancient tribes - Roman and Greek tribes - brought vines to the southern Rhone and they started propagating vines all the way up the river. Typically the wines have this wonderful peachy, sort of floral aroma. This wine has a little bit more weight to it than the Pinot Blanc we just had, I think because of the warmer region it's grown in. Just an outstanding food wine as well because of the dynamic fruit character. Chef Randolph's Notes: Our next course is Oysters Rockefeller. Now, Oysters Rockefeller really has nothing to do with spinach, cheese, or bacon. The original Oysters Rockefeller was made at Antoine's in New Orleans and it's made exclusively with fennel fronds, parsley, green onions, and anise. This classical Oysters Rockefeller should pair really well with this wine. Rosie's Wine Nots: This wine came in on little cat feet, then it took flight on gossamer wings. Quite delightful! This is my favorite. I love Oysters Rockefeller. Third Course: Cornmeal dusted and pan-fried catfish over red beans and rice paired with La Chabillienne, Chablis 2013. Kerry's Comments: Halfway between Paris and Beaune, Beaune being the northern seat of the wine trade in Burgandy in the Côte d'O, is a satellite region of Burgundy called Chablis. Chablis became quite the wine buzzword in the mid to late 20th century. A lot of people sort of latched on to that word to refer to any dryish white wine, but technically, true Chablis comes from that district surrounding the town of Chablis. The Chardonnay grown here is a little more northernly compared to the rest of Chardonnay being produced in Burgundy and this temperature difference contributes to the style of wine produced. Also, the soil is a Kimmeridgian soil which is a more ancient blend of limestone and clay and possibly some fossilized things from the former sea that was there. It is very minerally soil - almost a chalky type of substance- and that imparts this wonderful, dry minerality to this Chablis, which is what it's known for. Sometimes, the cold vintage years in that soil can make a Chablis very dry and austere. This is actually a wonderful example of a Chablis in that it is a Premier Cru Chablis. There are several different quality classifications in Burgundy. The Grande Cru is the highest. The Premier Cru is the second level and there are 17 Premier Crus in the Chablis zone. The Fourchaume Premier Cru vineyard site is known for producing wines that are a little bit more soft and a little bit more feminine. So that minerality, that chalky minerality, doesn't come through and it's not as bracing. The acidity is not quite as bracing, which I find is really quite lovely. Chef Randolph's: Originally when I saw Chablis on our wine list, I thought this would be the one to go with oysters. Well, no. It's not. It didn't have that chalky minerality, but it did have a really nice round flavor. I'm pairing it with a mishmash of flavors - red beans and rice with a nice, crisp cornmeal encrusted catfish on top. Rosie's Wine Nots: This wine was way too generous with her favors. She looked at me seductively, with heavily hooded lids. She was a jaded little nymph. She mouthed, "Come with me." I did. And I never looked back. Fourth Course: Duck and andouille sausage gumbo paired with Domaine du Joncier, Cotes du Rhone 2015. Kerry's Comments: On to the red wines. The producer is Joncier. This is technically a Cote du Rhone designation. It actually comes from the town of Tavel which is in the southern part of the Rhone Valley and is quite famous for rosés made from granache and varietals. Joncier is another property that's been around for a long time. About 20 years ago, Marine Roussel (daugher of Pierre who started Domaine du Joncier in 1964) took over the wine making and was committed to biodynamic farming and organic production. This is 98% Grenache and 2% Cinsault blended in, and is quite different from your average Cote du Rhone. It is densely packed blackberry and red berry fruits. It doesn't have quite as much spice as some of the Cote du Rhone. This is the land of the mistral - persistent winds which blow through the terraced vineyards, drying out the vines (and purifying the vines of parasites and mildew throughout the year), allowing them to have a densely-packed fruit character. Chef Randolph Notes: I paired this wine with one of my favorite dishes which I haven't done since I've been at The Saltbox - gumbo. I'm not doing a seafood gumbo, but duck and andouille, with a bit of spice. Rosie's Wine Nots: Ahhh, yes. The dense fruits. I tasted Skittles found in the corner of a pillowcase stashed in the back of my closet, lost since Halloween. The vibrant citrus forward of assorted Sweet Tarts tumbled across my tongue like an Olympic gymnast. I was in my element. This wine ... dare I say ... understood me. If Chefs Sprinkles knew how hard it is to shoot DOWN INTO a cup, I don't think they'd use them. It's hit and miss with the cups. If you're counting, this is number 5. Fifth Course: Seared tenderloin with crawfish étoufée paired with Château de Bellevue, Lussac Saint-Emilion 2011. Kerry's Comments: For our second red wine, we go to the region of Bordeaux - that historically famous area near the Atlantic Coast. The Garonne River and its estuaries split the Bordeaux region in half down to the city of Bordeaux which is a shipping area and trade city, trading in wine for centuries. There are two areas - the Left Bank and the Right Bank. The Left Bank of Bordeaux has some of the most famous chateaux and it's mainly Cabernet Sauvignon-based wines, although most of these wines have 4-5 different grapes blended in. It's very gravelly soil and has a lot of drainage which is why Cabernet does so well there. You go to the east side, or the Right Bank, and have a lot more clay and sand. Historically, those areas have always been better for Merlot and Cabernet Franc. The French realized this centuries ago and those towns and areas have used those varietals in their blends. Tonight, we have Château Bellevue. This is 2011. This is from the appellation of Lussac St. Emilion. St. Emilion itself, the towns and the region around it, are quite famous for these blends. This is mainly Merlot with Cabernet Franc blended in. Quite classy, elegant, deep dark red. Chef Randolph's Notes: We decided to go with your New Orleans surf and turf. A crawfish étoufée done with a dark brown roux, and a little piece of tenderloin on top of that with haricots verts and finishing with a Hollandaise on top. Rosie here: Then Chef Randolph started talking about a Choron Sauce which I admit I'd never heard of. I love it when I learn knew things! It is basically a Hollandaise sauce with tomato paste in it. The hamster just started running. The light bulb is beginning to appear. Rosie has a half bushel of oysters in her oyster fridge. She's weighing her options - I think we're having Oysters Rockesie and Oysters Choron for lunch today! Rosie's Wine Nots: This wine strutted in like a rooster in his barnyard, haughty and proud, with its beak in the air. A churlish wine, it tried to talk smack to me. I let it. On to our 6th and final course - Dessert By Chef Amanda. Sixth Course: Rum raisin bread pudding with vanilla ice cream and praline Crème Anglaise, paired with Lacoste Sauternes. Kerry's Comments: For our Grande Finale we're finishing up in the region of Sauternes which is also in Bordeaux. Hervé Dubourdieu owns three châteaux. Château Roûmieu-Lacoste, Château Ducasse and Château Graville-Lacoste. Two of them (Ducasse and Graville-Lacoste) are table wine producing or white wine producing in the Graves area (where he grows Bordeaux Blanc and Graves Blanc, respectively). In certain years in Grave and another little area named Sauternes, they will declare a vintage year. This doesn't happen every year, because in Sauternes, for them to declare a vintage year where you can actually make a wine like this, the grapes have to be affected by a beneficial mold called botrytis. This wine is 100% botrytized Sémillon. What happens on the Sémillon grapes is that this mold will form only in perfect conditions of humidity, moisture, and temperature late in the fall, already when these grapes are almost like raisins. The botrytis will settle in on the grapes and further shrivel them, which reduces the liquid content in them, so when your press the grapes they are even more concentrated with flavor and natural sugars. This makes an outstanding dessert wine. I'm not a huge proponent of the dessert wine. They're a little too sweet in the glass for me, but when you have it with a dessert like this one, it's absolutely sublime the way they marry together. Rosie's Wine Nots: What a delightful, rare indulgence for Rosie! I'm actually sitting in the vineyards at Château de Prétense. On a Grand Soir Beauville Fleurs de Lin tablecloth. The sun is warming my bare shoulders. The wind tousles my sun-kist blond tresses. My French lover offers me a Noble-rot affected wine which he thoughtfully paired with a satiny chocolate crème brulée encrusted with hazelnuts. There is a crystal plate mounded with dark, sultry berries. My French lover dabs at the drool in the corner of my mouth. It is lush. I am lush. And then I woke up and I was back at The Saltbox Café. Still life of red wine. 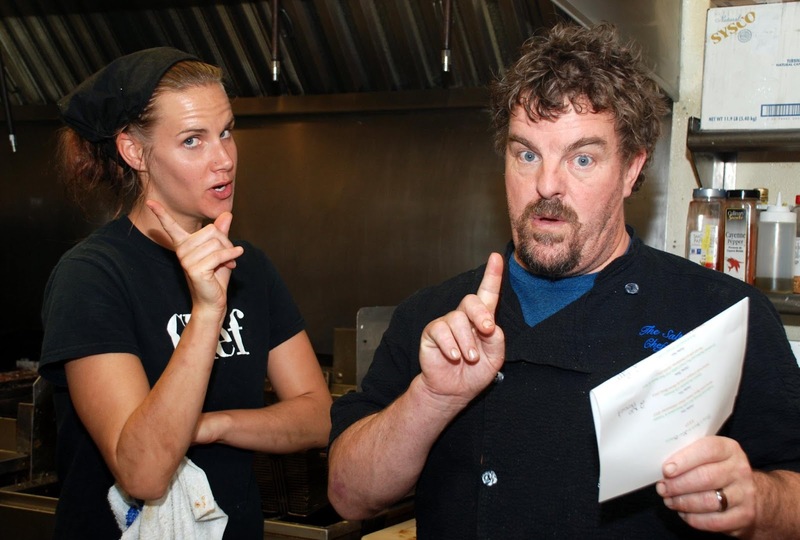 I don't know what Chefs Amanda and Randolph were reprimanding me for, but I'm sure I deserved it. Chef Randolph has that "deer in the headlights" look. Tonight's Crew - Mike, April, Chefs Randolph and Amanda, and Kerry and Joey of Tryon Wines. The Saltbox Crew - Nohea, Chef Randolph, Chef Amanda, April, and Mike. I cropped the above picture. We're calling that a "spot on the lens." Right, Amanda? April, you can run, but you can't hide! October 2014, we visited Spain. November 2014, we visited Argentina. December 2014, we visited Paris. March 2015, we visited Italy. October 2015, we visited Germany. December 2015, we visited Japan. Also in December 2015, we enjoyed a Réveillon Feast. And again in December 2015, we visited France. February 2016, we took a road trip to California. Also in February 2016, we visited Italy. March 9, 2016, we had a lovely visit to Chile. March 29, 2016, we visited the Pacific Northwest. April 20, 2016, we explored the vineyards of Oregon. September 2016, we enjoyed South Africa. October 2016, we experienced Madrid. October 2016, we traveled the Loire Region in France. November 3, 2016, we got to Fall In Love With Wine. November 14, 2016, we enjoyed a Taste of Northern Italy. December 1, 2016, we experienced a Night In Italy. December 14, 2016, we savored Holiday Reds. December 19, 2016 we enjoyed Christmas in Paris. January 5, 2017, we Played With Pinot. Sunday Lunch At the Hawthornes. Sunday Lunch. In Which Rosie Makes A Pizza. UFOs. What Would Rosie Do?